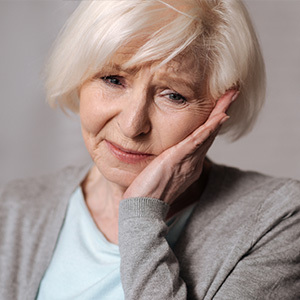 Tooth loss is a problem that affects many seniors—and since May is Older Americans Month, this is a good time to talk about it. Did you know that more than a quarter of adults over age 75 have lost all of their natural teeth? This not only affects their quality of life, but poses a significant health risk. According to a study in The Journal of Prosthodontics, significant tooth loss is associated with increased risk for malnutrition—and also for obesity. If this seems like a contradiction, consider that when you have few or no teeth, it’s much easier to eat soft, starchy foods of little nutritional value than it is to eat nutritious fresh fruits and vegetables. That’s just one reason why it’s important to replace missing teeth as soon as possible. There are several ways to replace a full set of missing teeth including removable dentures, overdentures, and fixed dentures. Removable dentures are the classic “false teeth” that you put in during the day and take out at night. Dentures have come a long way in terms of how convincing they look as replacement teeth, but they still have some disadvantages: For one thing, they take some getting used to—particularly while eating. Also, wearing removable dentures can slowly wear away the bone that they rest on. As that bone gradually shrinks over time, the dentures cease to fit well and require periodic adjustment (re-lining). Overdentures are removable dentures that hook onto a few strategically placed dental implants, which are small titanium posts placed in the bone beneath your gums. Strong and secure, implants prevent the denture from slipping when you wear it. Implants also slow the rate of bone loss mentioned above, which should allow the denture to fit better over a longer period of time. But overdentures, too, are not meant to be worn all of the time. Fixed dentures are designed to stay in your mouth all the time, and are the closest thing to having your natural teeth back. An entire row of fixed (non-removable) replacement teeth can usually be held in place by 4-6 dental implants. Dental implant surgery is an in-office procedure performed with the type of anesthesia that’s right for you. After implants have been placed and have integrated with your jaw bone—generally a period of a few months—you can enjoy all of your favorite foods again without worry or embarrassment. If you would like more information about tooth-replacement options, please contact us or schedule an appointment for a consultation.